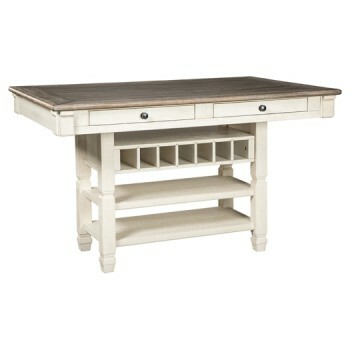 The beauty and practicality of this dining room counter table is something to savor. A two-tone textural finish gives this dining table with plank-effect top a double helping of charm. Four smooth-gliding drawers allow you to keep placemats, napkins and utensils right on hand. And if you love to entertain, you’re sure to toast this table’s built-in wine.